The New York Colonials defeated the Washington Blue Sox by a final score of 9-7 in a slug fest in game one on the auxiliary field. The teams combined for four home runs, six doubles, and 27 total hits in a back-and-forth affair that saw the Colonials score at least one run in each inning. Kamal Muhammad gave New York an early 1-0 lead, but the Blue Sox came right back in the second with two runs. The Colonials would not be deterred, however, as both Jacob Colombo and Brooks Carson launched home runs to make it 5-2 after two innings. Heading to the top of the fourth inning, the Blue Sox trailed 6-2, but they stormed back with three doubles and then a home run by Taisei Yamada which tied the game 6-6. Greg Barnette provided the lumber for a Colonial response when he led off the fifth inning with a single and came around to score on a sacrifice fly by Jake Luce to make it 7-6 in favor of New York. The Blue Sox answered and made it 7-7, but in the end the New York Colonials proved to be too much to handle, as Dante Biagini scored on an error in the sixth inning then Carson went yard for the second time to round out the scoring at 9-7. Carson ended up with four RBI’s on the day and Barnette finished with three hits, while Yamada led the Blue Sox attack with two hits and three RBI’s alongside three hits by Hayato Amamoto. 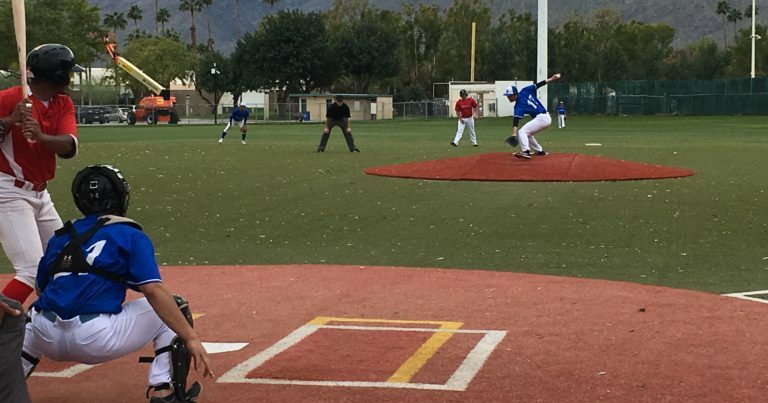 The Palm Springs Power scored early and often in game two on the auxiliary field, taking down the Manitoba North Stars 8-4 amidst cloudy and cool conditions in the afternoon. Chris Patterson led off the game with a single and Matthew Jeffrey got to first via a hit by pitch, and both men eventually scored to give the Power a quick 2-0 lead. Palm Springs added insurance runs in the next three innings, increasing their lead to 5-0 heading to the fifth. The North Stars continued to fight, and broke through to make it a one-run game when Nick Campana hit a no-doubt grand slam deep into the parking lot beyond the left-field fence. Other than that one pitch though, starting pitcher Seth Burris was effective for the Power, striking out eight hitters and only giving up three hits. The Power added to their lead with a run in the sixth then two more in the seventh to round out the scoring for the day. Campana was 3-for-3 with four RBI’s for the North Stars while Patterson, Jeffrey, and Lamar Briggs each added two hits for the Power. On the first game at Palm Springs Stadium the Palm Springs Chill froze the Alberta Grizzly 6-3. The Chill scored early and often with a couple base hits by Daniel Goss and Greg Saenz. Jimmy Lunardeli stepped up a batter later and smacked an RBI single. The Chill continued their scoring streak in the second by getting Brian Pozos and Nicholas Mira on base and letting Goss and D.J. Daniels drive them in with Saenz also crossing the plate in the inning. The Grizzly got their bats going in the fourth when Brook Clark hit a one-out double into the gap in right-center and Colten Traeger drove him in with a single. The Chill retaliated in the fifth scoring two more runs with RBI walks from Pozos and Mira. The Chill had a bases loaded two out situation when the Grizzly sent out Noah Lashley to pitch who struck out the next batter to end the inning. Keaton Slack picked up the win improving to 2-1 while Noah Gotsis took the loss after surrendering four runs over four innings. The second game of the day at the stadium featured the Canada A’s holding on for a win against the British Columbia Bombers by a final score of 4-2. The A’s struck first on a couple hits Joshua Henderson and Derek Bangert scoring two runs. For the A’s, Kyle Lazcano was dominant on the mound not giving up a single hit and facing the minimum through four innings. His streak would end in the fifth inning with two doubles in the fifth inning by Jalin Benjamin and Riley Conlan scoring the first run of the game for the Bombers. The seventh inning gave hope for the Bombers as Andrew Chin came to the mound and got the bases loaded. He would bring a runner home by hitting Jonah Dean-Hargroves keeping the bases loaded but get the final out off a fly ball in foul territory to Matt Holiday. Lazcano earned the win going six innings and striking out six and Garrett Brown taking the loss after giving up four runs over five innings with Chin earning the save.